National parks are the treasure of the American landscape. 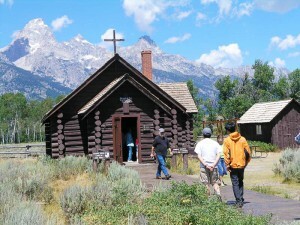 With over 400 locations covering 84 million acres across the United States and its territories, national parks inspire nearly 279 million visitors annually with their history, beauty, amenities and unique educational opportunities. In addition, they support 252,000 jobs — including 22,000 of their own full-time, part-time and seasonal professionals — and generate approximately $31 billion in economic activity. 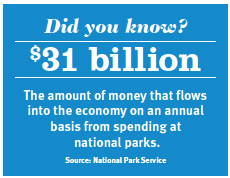 It’s no surprise then that when the National Park Service was required by the sequestration to slash $153.4 million from its budget, it would be a measure that would reach far beyond park borders and into neighboring municipalities. According to Jeffery Olson, public information officer for the National Park Service, the nation’s parks are not unlike small municipalities. They have their own utilities, waste management systems, water treatment facilities, roads, houses and other buildings that have to be maintained. He said that when it comes to choosing where to cut, even the smallest slice can affect tens of thousands of guests. When hours and amenities are curtailed, it doesn’t take long for tourists to tire and cut their vacations short. When that happens, neighboring towns and cities feel the pinch as well. In February the National Park Service released a peer-reviewed study that showed the connection between park tourism and the nearby communities, and how the parks continue to be critical economic engines for these areas. The study noted that one-third of total park tourism spending, or about $13 billion, went directly into communities within 60 miles of a park. The bulk of that money, 63 percent, is spent on lodging, food and beverage service; followed by recreation and entertainment (17 percent); other retail (11 percent); transportation and fuel (7 percent); and wholesale and manufacturing (2 percent). Although parks have tried to take the bulk of their cuts on the shoulders of the season, in order to be in good shape during peak tourism months, communities realize that delaying the opening day or closing early can have a big impact on the bottom line. When idle snowplows threatened to delay the opening of Yellowstone by two weeks this spring, the chambers of commerce in Cody and Jackson Hole, Wy., raised $170,000 to clear the roads. Local business owners who live and die by the tourism market said that the delay could have cost as much as $100,000. It was not a loss they were willing to absorb. Other communities, friends groups and organizations have also stepped up to the plate to bail out the national parks, which they feel provide an immeasurable benefit to their communities as well as to the entire nation. However, many of them suggested that the bailout was a one-time thing and not something they can afford to do on a regular basis. Jarvis agrees. In his testimony to Congress July 25 he said sequestration was designed to be inflexible and damaging, and that it undermines the work needing to be done.